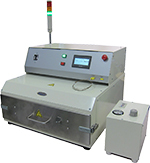 SHB-150R is a manual/semiautomatic wedge bonder for large diameter aluminum or copper bonding wire and ribbon. The compact table-top unit is ideal for laboratory, prototyping and small scale production. Table-top solder ball mounter for BGA type IC packages, is capable of placement ball diameter of 0.2mm above. Easy programmable ball matrix pattern with touch panel. SMU-50 is a precision solder ball re-balling unit for BGA type IC packages, using metal masks for solder paste and ball placement. Capable of both vacuum and pressure process, minimize voids in solder joint. Fluxless reflow soldering with formic acid vapor or forming gas is also available. Large work area and rapid cooling system drastically reduce process cycle time in flux-less and void-free soldering. High efficient Carbon Lamp Heater equipped, compact reflow oven SVO-1 is available not only for reflow soldering, but also for curing thermoset adhesive, heat treatment and drying with constant temperature etc as versatile heating oven. Small footprint compact reflow oven STR has two way reflow temperature profile control with 5 steps setting for ramp rate and dwell time.